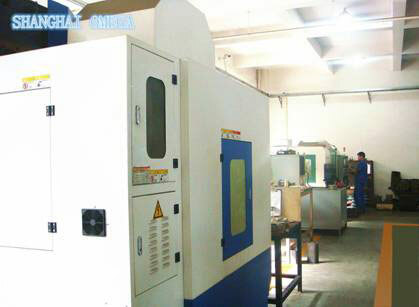 Although there are huge numbers of enterprise specialize in manufacture and sale of single screw extruder & parallel twin-screw extruder, and its core parts in China, but in this area the companies which can truly in-depth research and development of new materials and new technology, to put a lot of research and development costs yearly to improve the service life of these core components, are still few and far between. Such as for a bimetallic barrel(Liner), the tungsten carbide reinforced nickel-based coating, its hardness gradient now is one of big contradiction which is still plague us, we must develop a new molding process; such as for even higher wear resistance & corrosion resistance requirements of the polymer material forming, tungsten carbide reinforced nickel-based coating maybe can not meet the use, we must develop a new crafting material. Such as an oval liner inside the segment barrel, or the manufacturing material still hovering in simple die steel quenching, the high speed steel quenching, its wear-resisting performance is limited; or only rely on manual processing on the old conventional common machine: to grind two parallel holes by an internal grinder, that the center distance error is too large; to grind elliptic outside arc by common cylindrical grinder, that not only both arc size cannot guarantee, but also cannot finish the correct size between the cylindrical surface and the flat surface..., the result is the size tolerance, the form and position tolerances cannot up to standard... .
Shanghai Omega Group Company goal, is to keep on exploring and contributing to the development of industry. Our one factory in Anhui province, mainly to manufacture more kinds of wear-resisting and corrosion resistant alloy layer of bimetallic barrel and screw. Our another factory in Shanghai, focuses on research and development of high-end alloy material, focus on the manufacturing accuracy which can completely compete in the European market at the heart parts using the CNC machining centers. For example the superhard high vanadium iron material we just completed research and development, more one extremely high wear resistance material, which can match the grade of 99.3 of the German W&P company. The oval liner manufactured from this kind of material, especially for side feeding section, for high filled or reinforced plastic mixing barrel, the service life of ascension would brought the Gospel to users and historic change.